Brands Hatch has always been good to me, delivering a few podiums over the years and an outright win in my first season of British GT. My Pro driver partner, Joe, loves the track and is always quick there. So we were both looking forward to the Brands Hatch round. Given some of the recent results we had ‘enjoyed’, we were no longer in contention for any of the championships, but we had decided that we were going to have some fun, and really go for podium finishes at the last two rounds of the championship. It seemed that we had forgotten to let our car in on the secret, and it had different ideas. Having been bashed around a bit at Silverstone and Spa, early in FP1 at Brands our car decided that it had had enough and wouldn’t be propelling us towards the podium anytime soon. A new engine was needed, before it was due to be replaced. It looked spectacular as flames shot out of the exhausts and sounded as gravelly as a Johnny Cash ballad, but it wasn’t going to get us anywhere for very long. This required the team to put in another all-nighter to fit a new engine. 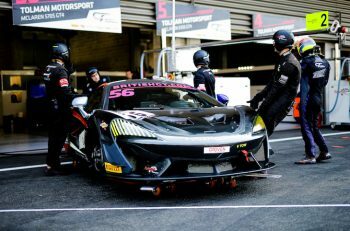 McLaren very generously offered their Woking facility and the team trooped off at around 2pm on Saturday for another 5am finish on Sunday morning. Deservedly winning the team of the weekend award and the maximum gratitude of Joe and myself. With the car being away, it left a lot of spare time on the Saturday and not much in the way of helpful data to fill it with. 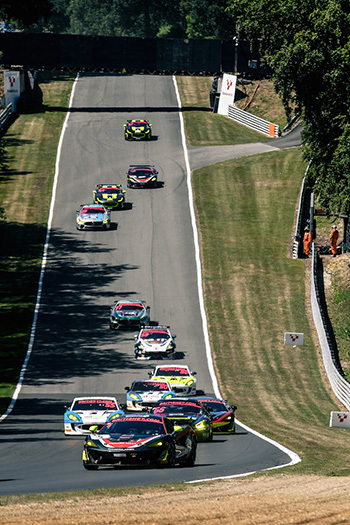 We had done a round of European GT4 in May at Brands Hatch, to get some early-season live testing in, so we had that to look at, but it wasn’t quite the same. To be honest, watching everybody else during qualifying was painful and miserable. Yes, we had the kids in the other cars to cheer on, but we really wanted to be out there in the mix, and we weren’t. The biggest problem was the amount of thinking time that was available. I have talked before about my ability to overthink things, so of course I found my mind wandering to a lot of ‘what if’ places. Which subsequently then led to a lot of ‘what next’ places. When you’re at a race weekend, you want to be in the car, not floating around the paddock a bit aimlessly. The good news was that by Saturday evening it was becoming clear that we would have a car to race in on Sunday. The only thing to be decided was whether the car would be ready for warm-up at around 10am or whether it would be straight into the race. Peter, the very helpful Race Director, was making sure that we had permission to race and SRO were helping to smooth things through. For the second race running, we’d start from the back of the grid. Saturday night was a subdued dinner with Joe and myself. We discussed the fact that Joe had not been in the car racing since the end of May and we were now at the beginning of August. We talked a lot about good seasons and bad seasons and why there seemed no rhyme or reason as to why they happened. Joe, as ever, was clinical in his analysis. We then strayed into the aftermath of the Spa accident. Joe, for some reason that I would put down to him just being a great coach and team-mate, decided that he was to blame for the accident. Perhaps pushing me too hard. I immediately described that as rubbish, or something like that, and suggested that my incompetent mistake was the only cause. 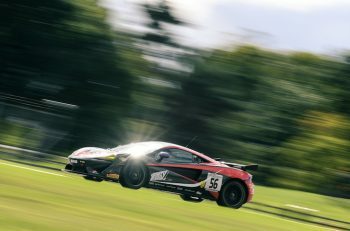 But where we did agree was that the grid in British GT4 was now incredibly competitive and over half of it was now Pro/Pro. This gave it a very different complexion to the GT3 grid, that had resolutely remained Pro/Am. We started to talk about whether this increasing competitiveness was putting additional pressures on the Am drivers to over-deliver. We didn’t really reach much of a conclusion, but felt there was something in it that might need addressing. Having put the world to rights and slept on it, I woke up on Sunday morning to a text from Chris, the Team Manager, to tell me we had a fully operational car and would be out for warm-up. The sun was shining as well. All weekend I hadn’t once checked the myriad weather apps on my phone, I must have been distracted! Because of the noise regulations at Brands Hatch, they always have the fans’ pit walk early in the morning so as not to waste valuable track time. It was, as ever, great fun with the very knowledgeable fans, who seemed to know about our problems and wished us well. There were lots of kids with big grins. This is genuinely one of my most favourite, uplifting times of the weekend. As an aside, I really enjoy the ‘British GT Fans’ Facebook page and would recommend anyone to take a look. Warm-up lasts for 10 minutes and is usually used just to make sure that everything is working properly. For us we had a long to-do list. We needed to cram in making sure the car was okay, getting to the optimal setup, getting ourselves up to a new-tyre pace, making sure I was ‘on it’ and squeezing in a driver change. All of this in about four laps. As you have probably worked out, that was to prove impossible. Having said that, when I got into the car it felt good and certainly manageable. The engine felt strong and the setup was good. It was going to be a hot afternoon, so the track would probably be slow. One of the upsides of not running on Saturday is that you don’t use any tyres. So, we had plenty of new tyres available. We all thought that might help us a bit. Then it was race time. Before I got into the car, I resolved to myself that we were going to finish the race even if it meant getting out and pushing the car over the line. With the fully loaded car weighing about 1800kg, I was hoping that wouldn’t be required. I was going to work as hard as I could. The team deserved a result for all their hard work, Joe deserved some proper race time and as my son and his family were watching, I wanted them to see something. We were on the grid and at the back. Three cars were in front that I needed to get past quickly to try and get on the back of the leaders of the GT4 Pro/Am grid. Our starts had been good all year, but being that far back, and with no real sight of what was going on, the start wasn’t great, but I managed to get past one car, up the hill at turn two. The same for the second car on lap two. All the time I was watching the rest of the pack disappear into the distance. The third car took a little longer, although I was alongside on lap two on the outside going into Hawthorns. A very fast right-hander at the end of the back straight. The inside is the racing line and therefore where the grip is. I am sure Ayrton or Lewis would have managed it, but David decided it could wait a bit longer. Once past, all I saw was empty track. I think it’s hard to describe how difficult it is to keep at maximum pace with no target in front and no-one pushing from behind. This is where the Pros are so good. Banging in competitive lap after lap no matter what the circumstances. Of course, the harder I tried the more I overdrove, and the times didn’t improve. Then coming up through Sheene to Stirlings, a slightly less hard Ginetta was parked backwards in the gravel. I was hoping for a safety car and told the team over the radio. They were on it immediately but the GT3 leaders were not far behind me and if they got past me before the safety car was deployed, I would have effectively gone a lap down and then the race was over. I suspect the next half a lap was the fastest I drove all weekend, and then thankfully the safety car arrived. This gave me the chance to get onto the back of the people I wanted to be racing and I had enough time to do it. At the restart, another Ginetta bolted a little, well a lot, before the safety-car line and then had to slow down. That made the first overtake pretty easy into turn one. The Jaguar I was lapping, on the other hand, made life unnecessarily difficult, but I got there after a few corners. Even so, it was amazing how quickly the other cars had pulled away. Just as I was setting about catching them again, the two cars I had overtaken had a big coming-together on the pit straight and this time the safety car was out immediately. It was a big crash and we went through the pit lane on three or four occasions whilst the debris was cleared. Off again and right behind Mark in the fast Mercedes. Another Jaguar to lap and another piece of Joe wisdom to help me do it. ‘Let Mark do all the work and follow him through’. Which I, and he, duly did going into and coming out of Druids hairpin. With the aid of a helpful Jaguar this time. I stayed with Mark and again had the opportunity on the outside at Hawthorns and again decided not to do it. Chris later reminded me that in my first season in British GT I had overtaken around the outside at Hawthorns and we had won the race! Ayrton who? Lewis who? It had been an eventful stint. I have never overtaken so many cars in a race. At the pitstop I came in 13th having started 20th. I fell out of the car and was absolutely exhausted. They say women glow, men perspire and only horses sweat, but I was definitely in equine territory at that point! By the time the various pitstop time differences had kicked in, Joe left the pits fourth overall and fourth in class. He was about 10 seconds behind the leaders. The first four were all Pro/Am cars. The safety car had really helped the Pro/Am teams. All we had to do now was watch Joe perform his magic. As I said earlier, Brands Hatch is one of his favourite circuits, so we had high hopes. He was more than a match for the cars in front. But some technical gremlins appeared, and the rest of the race was about bringing the car home. Joe did a great job and kept the gap to the leaders at about the same. One of the superfast BMWs got past Joe, so we ended up finishing fifth overall and fourth in class. Not bad having started dead last, but still a slight feeling of disappointment. My drive had been pretty good, and I had worked really hard. Joe wasn’t able to show his very best, which was a shame for us all, because Joe on a charge is a sight for us all to behold. Another ‘challenging’ weekend had come to a close. It was good that we could deliver a result for the very hard-working boys who worked on our car. For the second race weekend in a row, they had delivered above and beyond. There were some positives, but the overwhelming feeling was that this year just wasn’t meant to be our year. An overall win at Snetterton had delivered the very high high that we all crave at the racing weekend. Confirming that racing is a drug that is very easy to get addicted to. The last race weekend will be at Donington Park. We ran well there last year and really want to prove, mainly to ourselves, what we can do if a few things choose to go our way. And maybe they will. Prior to the Brands Hatch weekend, I was trading messages with Graham in the Balfe McLaren, which has also had a mixed season. We agreed that it would be good if we won one race each at the end of the season. Graham and Mike duly, and deservedly, won the race at Brands. So maybe, just maybe, it will be our turn at Donington.